The NES Classic Edition arrives this month, and ships with a wired controller which is a close match for the pad that accompanied the game-changing 1985 console. While being tethered to the system by a cord no doubt adds to the authentic retro experience, there will be some players out there who are young enough to have never known the thrill of accidentally pulling their console halfway across the room by the controller cord, and those same lucky individuals will no doubt be looking for a wireless solution when their NES Classic Edition turns up later this month. Thankfully, peripheral maker Nyko has one. 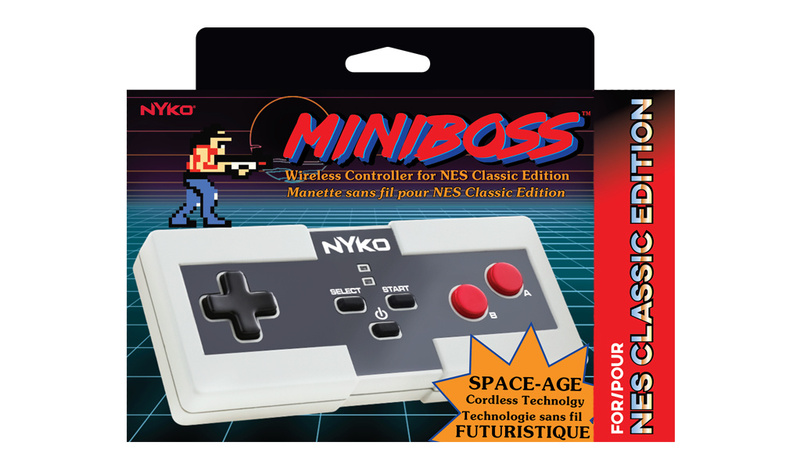 The Miniboss controller for the NES Classic Edition can be used up to 30 feet away from the system and uses "space age" cordless technology to link the pad with the system via a special dongle. + 2 offset ergonomic face buttons - Two is all you need! The original NES is a legendary console that so many of us have fond memories of, and we've set out to create an accessory that offers what we at Nyko do best – augment the gaming experience with creative design while respecting the charm of the hardware it complements. We envision gamers playing the amazing lineup of NES Classic Edition titles on their massive flatscreens at home, which require a little more distance from the screen than the old tube TVs. The Miniboss will allow us to play from the comfort of our couch without having to pull the console out to our coffee table. In addition to the Miniboss, Nyko is also launching the Extend Link cable on the same day for $9.99. This extends the reach of your NES Classic Edition controller by 6 feet. Do either of these products interest you? Drop a line below to let us know. That looks so ugly. but kudos to nyko for giving more options to people. I'll be getting the NES mini controller though. @Ryu_Niiyama I thought the same thing. I'll deal with cords if its going to be that ugly. Yeah not very appealing from a visual standpoint. All that "futurstique technolgy" and still did not cram an autofire option in there! @Ryu_Niiyama @Spoony_Tech Yeah. I mean cordless is nice and all, but this is so ugly. And, come on, I used to sit 3 feet away from the TV anyway when I first got my NES. If there's no one saying I'm sitting too close to the tv it's not a real NES. But I understand and to some extent praise Nyko for offering these options, although it will probably be extension cords for me. People that refuse to play wired on this mini console simply don't understand the whole idea and purpose of the pure retro experience that the NES Classic Mini wants to offer us. If it works well, feels good in the hands and has a decent quality build, I couldn't care less what it looks like. I'd rather play wirelessly. My TV is a good distance from my couches and I have hardwood floors. I'd rather chill on my couch. Aesthetics have nothing to do with it. D00D! Gnarly is a good thing! Why would they abandon a good thing!? I have to wonder how the buttons feel vs the stock pad. I'm sure better looking controllers that offer wireless will be released, but I remember back in the NES days.. those third party controllers just didn't cut it in terms of feel and response. No thanks! Why does it have to be so ugly? @RichardsShadow The no name NES controller I have feels almost exactly like the Nintendo one... Except it's rounded on the edges, so it 's more comfortable than a rectangular brick, and the connector cable wires out from the top left side instead of the top middle. Probably to avoid copyright issues. Oh, and it had two rapid fire buttons right above the normal A & B. @ThanosReXXX I was around for the infancy of gaming. I cut my teeth on the first Apple computers and programmed my own basic games on the Apple II, IIe and the first Mac. I input and edited games from magazines on my C64, played Pong and Space Invaders in the arcades the years they came out. 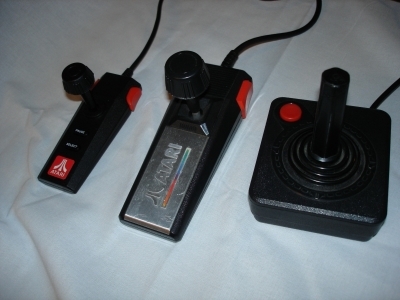 I played my first cartridge games on Atari, Intellivision, Coleco and Odyssey 2 systems. I've owned pretty much every major (and not so major) system in between up to this day (Only missing a PS4 at this point). I'm pretty sure I understand the experience and get the retro vibe. And yet I want wireless controllers. A lot. But I think YOU'RE missing the point. Since when did the NES have built in games, HDMI ports, multiple display choices and internal save slots for each game? This is anything but a 'pure retro experience' and what the 'NES mini wants to offer us is a cartridge-free, customizable retro gaming experience that is the everything the original was only better. I suppose you'll miss blowing on the cartridges too. Not nice to be so judge-y. This is Nintendo finally going head-to-head with custom emulator (retro) consoles and trying to 1up them with a uniquely nostalgic vibe that only Nintendo can nail (well, not entirely true: This is actually a far closer to NES experience... Nintendo missed this opportunity to sell mini cartridge swag - http://www.3ders.org/articles/20160729-blogger-builds-3d-printed-nes-console-with-cool-nfc-tag-cartridges.html). I get the purist thing, but don't call people out because they want wireless. The NES had wireless offerings back then too. I'd actually like Nintendo to do an official version of this kind of thing with a traditional NES controller design that has the ability to be used both completely wireless or with the cable connected so you can play properly wired with zero input lag. And, that cable on this alternate wireless/wired official controller needs to be a lot longer than the current one too. But, seriously, why am I even having to say this out loud? Genuinely: Isn't this kind of thing so beyond obvious that it's just a little bit absurd Nintendo isn't already offering it as an option? GNARLY: difficult, dangerous, or challenging. "he'd taken a fall during a particularly gnarly practice session"
@Damo Honestly, I always thought most people use gnarly in a positive way. Ya know, like surfer/skater dudes in American movies going "That's gnarly, man!" or whatever. But maybe I just interpreted it wrong all these years. I do have to buy a second controller. Don't they have a cordless that looks like the real thing? I have also seen that they are also releasing an extended cable as well. Saw it for pre-order on Gamestop. Said on the package that it was 6 feet. Eh. I actually don't mind the cord at all. Actually, I'm picking up an EMiO The Edge gamepad, as it has rapid fire and a 9 foot cord. @impurekind I think it's one of those "Bad meaning good" things. I preordered a NES Mini because it LOOKS LIKE the real one, and the controller is an exact replica, aside from the piece that plugs into the console itself. I want the cords and they are part of the experience. But I welcome the initiative as it's an option for those who won't get the NES Mini for its nostalgic appeal. I'll get an extension cable if necessary, I found one at 6 dollars on eBay. Face buttons off set in the wrong direction. Seriously trying to make this as unergonomic as possible eh Nyko? And what is up with that d-pad? Next time consult someone who plays classic games. A wireless controller would have been awesome, but this one is useless for the platform heavy console where holding down B to run while tapping A to jump at the same time, is a constant endeavor. I'll take the extension cables instead thank you. But how is the d-pad? So I'm hoping that soon we'll see lots of extension cables available online! @Tsusasi Nope, I'm not missing any point. And maybe not all retro gamers are purist like me, but a lot of us that are well over forty are (46 myself, and played everything under the sun at the time it came out, including Pong on a black & white portable TV), and besides the whole HDMI port and save slot thing, we would like to have the most genuine experience possible. The HDMI port is simply a logical extra to provide for connecting it to a modern TV, so that doesn't take anything away from the retro experience. Same for the display options: because of the modern TV and connection it is impossible to get that retro look in your games, so to provide for that, Nintendo has included these options. Again: a logical and useful addition that takes nothing away from the still very genuine retro experience it will offer. A lot of those people are the same ones that are whining that there is no Virtual Console or internet connectivity on the NES Mini, and that too is grossly missing the point of the device and the experience it wants to offer. And Reggie Fils-Aime himself has made statements that are more along the lines of what I've said, so your interpretation of what the NES Classic Mini is supposed to offer isn't correct. "Playing these retro games using a retro controller makes the experience that much more authentic." That Arduino version with NFC cartridges is nice, I've seen the video of it before, probably here on NLife, but it isn't the real thing, obviously, and build quality also doesn't seem to be on par. The thing that I'm still a bit baffled about is that the NES Classic Mini practically came out of nowhere, and Nintendo certainly didn't have to make it, but all that people seem to be able to do is whine and moan about all the things that it doesn't offer, instead of focusing on the things that it actually does offer. And that is a grade A retro experience with Nintendo quality and 30 great games, that are meant to be played offline, with cabled controllers, just like the original versions. It may not be everybody's top 30 list, but if they would have to cater to everybody, then they would probably have to add the entire catalog of games to it, and that is obviously not an option considering the investment and the projected ROI. And all of that is what I'm opposed to. That's not being "judge-y", that's me being sensible and actually happy with what is on offer instead of complaining about all the things it doesn't do. "In addition to the Miniboss, Nyko is also launching the Extend Link cable on the same day for $9.99. This extends the reach of your NES Classic Edition controller by 6 feet." looks ugly and cheap, plus I rather have the one with the NES classic because it looks and feels like the original, and you can use it on wii/wii u virtual console games. @toxibunny That was already confirmed when it was revealed. And no dongle, it simply has the same connector at the end of the cable as the Wii Classic controller or nunchuk. Wired controls are better since they don't eat batteries / require charging. I guess people like devices that require batteries / charging up. @ThanosReXXX Ikr? I heard gnarly and all I could think of was a bill and ted air riff duet going on. Perhaps gnarly is bad in the UK? Come on Nyko, you couldn't make it dogbone shaped like the far better NES controller that came with the top-loader? You elevated the A button like the dogbone controller did, but you still kept the same boxy uncomfortable design of the original NES controllers? This wireless controller is so close to being exactly what I wanted yet Nyko still just barely missed the ideal mark. @ThanosReXXX I was born in the 80s and even I knew that Gnarly always was a positive thing. @toxibunny Ah, okay. My bad. @toxibunny And you're probably right then. If they connect to the Mini, they can also connect to the Wii or Wii U, unless it uses some kind of weird protocol that only makes it work with the Mini, but I think that is highly unlikely. But why did they make it so ugly? ...and here I thought cords were totally tubular..
Will they include a long stick for the reset button? @jbopatrick It's not useless to me. The way I hold a controller, it's perfect. I hold a controller loosely with my fingers behind the pad, not where shoulder buttons would be(never liked shoulder buttons much for that reason). I think I play that way due to favoring Sega consoles as a kid. It was never an issue until SNES came out anyway. I suspect companies use that offset because more people prefer it, assuming they've done research. Nintendo has used that layout before on the dogbone and the GBA. With all that said, I think having no offset at all, like actual NES, SMS and PCE pads, would be better so that it doesn't bother people like you, since I have no problem with buttons laid out horizontally. As others have said, I don't like the design of this pad, I want an authentic looking and feeling experience from the Nes Mini. However, I am interested in the extension cable. I was actually googling extension cables with a classic controller connector just yesterday. Seems they are available in the US but hard to come by in the UK... also, most of them are white, to match the standard Wii look, but a black cable would of course be preferable for the Nes Mini. @samuelvictor Cool! Good to know. I'll go get my air guitar. @Ryu_Niiyama Oh man that dreamgear pad is even uglier... four shoulder buttons on the same line? Eww  and shoulder buttons on a Nes pad in general? Eww also! Nyko? No thanks. They lost my business when their Gamecube memory cards corrupted on me... costing me YEARS of game progress. And look at that cheap budget Contra guy... eww. ...meant that it was actually a good thing. Gnarly, like maybe rough and twisted, knotted even? Sounds like a righteous description for cords then! And gnarly being considered positive? Of course, just look at how many knots get posited on them cords! That's why we're like totally on board with having that radical cordless technology, right dudes? I see they enjoy input lag. I don't. @123akis They do! I've ordered a few things from them. As much as I want one of these systems, I would be wasting money. I own a lot of those games already via vc and i would just end up buying an original system anyways to get all the games that aren't on the nesmini. Either way I'm saving every penny for switch. I except to spend several hundred on that launch day. Console, games and accessories. Hopefully an otterbox. The default controllers should have been wireless to begin with. I've always preferred first party controllers over third party. Wireless dose have its advantages though. The extension cable will be needed for sure since Nintendo made the wire so damn short. They cheaped out by not going wireless and cheaped out again by shorting you on the wire. I would rather have a longer wire and no HDMI cable included. But since I don't see any stores taking preorders in Canada I don't expect to get one of these. I can't seem to find an extension cable on Amazon or even eBay to go between the mini and the 2.5 ft cable of the controller it ships with. Plenty for Gamecube controllers, but nothing to help us here. Has anyone else found the cable we need? Thanks! @ThanosReXXX But see, there were any number of wireless controllers throughout the history of Nintendo gaming, including the NES. To me, wireless doesn't make the experience any less authentic. Would I have liked a wireless controller with the original Nintendo pad build and design? Sure. But if this feels good and works well, I'll be ok with the look. There are downsides to the wired experience as well. My TV and consoles are at the opposite end of the room from my seating. There's no way it will reach. Due to my disabilities, it would be difficult and painful to sit on a hardwood floor directly in from of my TV. Also, tripping over the cord, accidentally pulling them out, pulling the console off of the shelf - all things that have happened in my years of gaming. Does that mean there shouldn't be a cabled controller? Of course not. But I don't see myself enjoying the games any less or wireless controllers throwing up some barrier between me and nostalgic gaming experience. If the emulation is flawless and the controller feels right and latency doesn't throw off the whole experience, then it's all good for me. If I get one for another room in the house, I'll probably even look for an old CRT TV to hook it up to and have close seating. I appreciate your well thought out response though. And I get it. I just don't think it takes away from the experience the way that you do. Unless of course they turn out to be crap. @Tsusasi I can understand that in your specific situation wireless would be better/more convenient, but most gamers back then didn't play with wireless controllers, even though there were indeed some manufacturers making them back then already. But the battery life sucked (my cousin had a few for several different consoles, and most of them have ended up in the trash can), and only in the last decade or so have they perfected both battery life and signal reception on these devices, so back then, it was a rather inferior experience, regardless of the convenience of not having cables. @ThanosReXXX The 'feel' that you mention; I get that. Even more than Nintendo, SEGA systems and controllers and their feel and timing were incredible and once you get to the 6 button controller, nothing compared for me. To this day I really can't play Sonic CD on any other platform; it just doesn't play the same. Same for Mickey Mouse: Castle of Illusion. Most other games too, but these were very pronounced. So I definitely get that. Sega also had wireless 6 button controllers that actually were really good and kinder to batteries. And the Wavebird was so amazing, that was my controller during the Gamecube era - period. I had 4 on-hand for gaming sessions. So I may have had better experiences and was all-in early on, which makes my pov slightly bias I guess. Add to that the convience and lack of pain-inducing squatting and there you are! Glad we could agree to disagree and still find some commonalities! I do have one tiny niggle left to add to the discussion: although I did use the Wavebird at times, I hated the fact that it lacked rumble, a feature that I was completely accustomed to by then, so not having that in the Wavebird annoyed me. On the Wii I do have two third party wireless GameCube controllers, One from D3mon and one from Q-ware. Both work fine and also have rumble, but it is a different experience, so I don't use them on the GameCube, but my Wii is my current go to retro machine: I modded it, attached a 1TB hard drive and filled it to the brim with Wii, GameCube, Neo Geo, Genesis, NES, SNES, GBC, GBA, A2600, Colecovision, Amiga, Turbografx, N64 and PSX games. But as you probably have gathered, my first real wireless experience was the Wavebird, and because of the whole "no rumble" thing, I also kind of ignored that most of the time. I did try out those wireless controllers at my cousins, but all I remember about those was that the buttons didn't feel quite right, if you know what I mean. People used all kinds of terms to label the feel of third party controller buttons, like clicky, spongy, etc. but suffice to say that they were mostly different from the real deal. But I can definitely also see your point, especially if you've been used to them for so long, so I understand where you're coming from. Seems there is another wireless controller available on Amazon for preorder by a company called dreamGEAR. It's called "My Arcade GamePad Classic", listed at $14.99, along with a pro version with "x" and "y" buttons for 19.99. It's looks a bit nicer, but the images seem to be renderings and not the actual product. Have you forgotten than you can use a wii classic controller to play as second player? And also the nes controller is compatible with wii/wii U games (specially VC) so you can understand the cable lenght, it is for conect to a wiimote so is obviously it has very little lenght. This bland looking Mini Boss apparently does not work. @Flauber well, there is always getting a custom decal. I think they were trying to avoid having to pay too much.